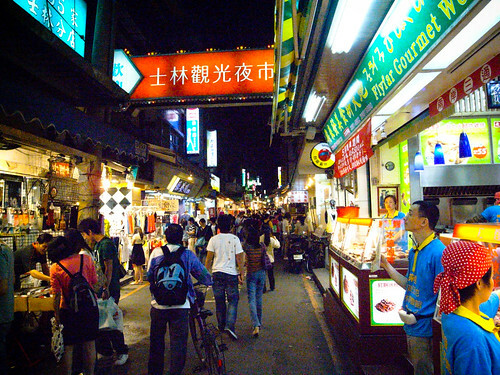 We talk a lot about the Summer Night Market (aka. Richmond Night Market), but it’s not the only game in town. 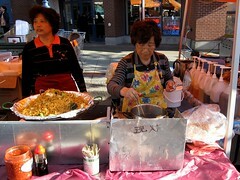 The Chinatown Night Market has been going on for 14 years now. 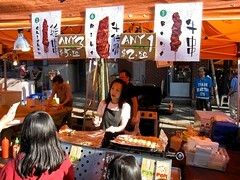 It amazes me that a city could support not just one, but two weekly Asian night markets. …runs from May 15, 2009 to September 6, 2009. …is open from 6:30PM to 11:00PM every Friday, Saturday, & Sunday. …is located on Keefer St. between Main St. & Columbia St. (map). The reason we haven’t talked about it is because we haven’t gone for years. I actually never go to Chinatown. Not a fan of the downtown eastside and Richmond more than satifies my Chinese cravings. However, I was in the area last Saturday and decided to finally check out the night market. I had low expectations. I arrived around 6:30PM: minutes after the vendors finished setting up their booths so the pictures might look more like a Chinatown Day Market. Fantastic weekend weather we’ve been having eh? This market is very tiny compared to the Richmond Night Market. There are about 10 food booths and 10 non-food booths. Its footprint is a single city block stretch down Keefer St. It’s quite nice. The night market in Richmond is located on a warehouse parking lot behind a Home Depot whereas this one has historic Chinatown as a backdrop. As usual, I skipped past the non-food booths selling crappy merchandise (check out the 8-ball PiMP stick in that pic) and went straight for the food booths. Pretty standard stuff here. 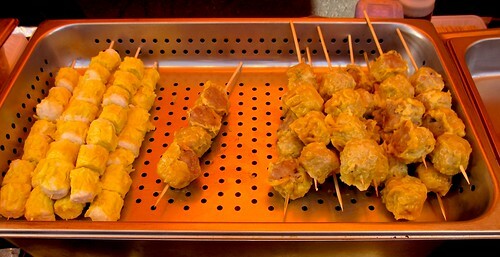 Curry fish balls, takoyaki fritters, bubble tea, chow mein, dim sum, bbq pork buns, spring rolls, meat skewers, gai dan jai (chinese egg pastry), etc. 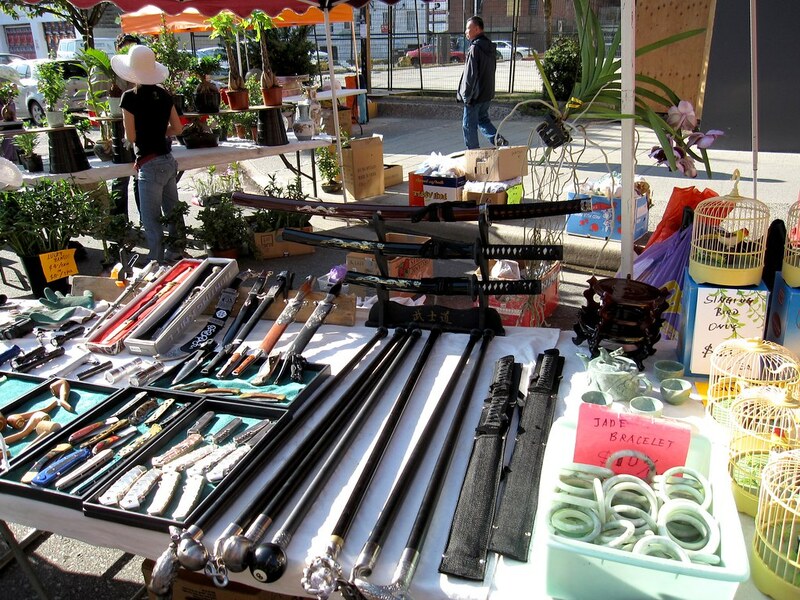 Things are generally priced from $2 – $5 each. I had me some curry fish balls (tangy), siu mai dimsum (yum), mango bubble tea (bland and artificial), gai dan jai (great! ), and deep fried tofu (crispy and fresh). BBT aside, everything was great. The real star of the show were the rice noodle rolls aka. chee cheong fun. You’ve probably had rice noodle rolls before. They are a popular dim sum dish. 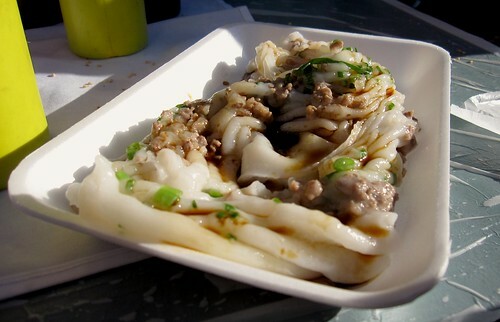 They’re made from rolled rice noodle sheets which in turn are made from rice flour and water. You can buy pre-made packs at any grocery store for a few bucks. One of the booths here has rice noodle rolls individually made to order. I’ve never seen the process done before – it’s pretty cool. They were probably the best rice noodle rolls I’ve ever had. The entire process takes a couple minutes. 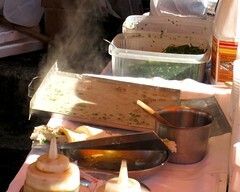 First, they pour a viscous rice flour and water mixture onto a shallow metal sheet (pictured left). They add dried shrimp or fresh shrimp or beef to the mixture depending on which flavour you ordered (I got beef). You can also add an egg. The metal sheet and mixture is then slotted into a metal box steamer. See that box covered with Beat 94.5fm stickers in the right picture? That’s the steamer (do the stickers add flavour?). The mixture is steamed for a couple minutes in the box until it turns into rice noodles. After it’s taken out of the box, they’re not rolled into noodles but simply scrapped off the sheet onto your plate. As the noodles are scrapped, they get folded into an interesting texture. This is the finished product, after adding some sweet soy sauce. As I said, it taste fantastic. Super fresh. And it only costs $3 (+75 cents if you add an egg). The Richmond Night Market doesn’t have this. They have normal rice noodle rolls that are great, but they’re not made to order from scratch. The night market in Richmond does have bigger and more obnoxious crowds, more expensive headache-inducing parking, and more booths selling crappy merchandise. I came here with low expectations, but I left pleasantly surprised. 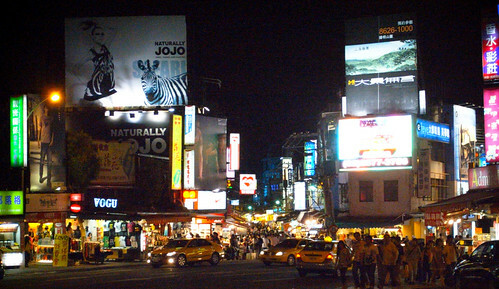 There’s not much to do in Chinatown – especially at night – so you’ll have to find something else to do after visiting this night market. If the weather is nice and your stomach is empty, I’d definitely recommend stopping by the Chinatown Night Market for some fast food. 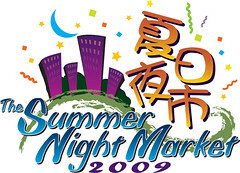 News: Summer Night Market 2009 has begun! 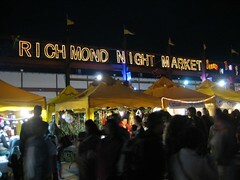 The Richmond Summer Night Market opened its doors tonight for yet another iteration of the popular summer festival. It’s open every weekend until October 4th, 2009. We’ll be visiting soon.Will Ed continue his tradition of eating a Mango UFO? Will Dan get arrested for purchasing pirated DVDs? 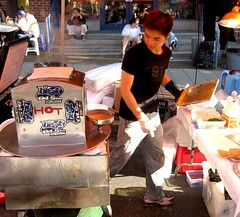 Will the Summer Night Market be shut down by a federal court ordered injunction? All these questions will be answered soon! Stay tuned! A news update on the Richmond Night Market. 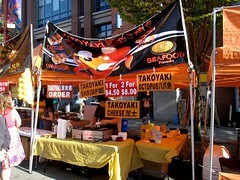 The Richmond Night Market has been serving up Asian street food (and other festivities) every summer since 2000. It’s grown in popularity every year and, love it or hate it, is a unique event in Vancouver. We covered it last year. There were some serious question marks as to whether or not the event would return this year. So the summer night market is off for 2008 right? Nope, it’s ON. 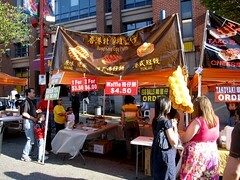 Paul Cheung (Lions Communication, organizers of other Vancouver festivities throughout the years), has acquired the necessary permits and will be hosting the night market at the same location (12631 Vulcan Way) under the new “Summer Night Market” moniker. Sweet! So when can we check it out? So, as long these 2 complications do not delay the opening, I guess we can begin looking forward to summer nights of tasty Asian street food, cheap Chinese ripoff products, and stressful (slightly cheaper?) parking.